How can I disable adding Items on the fly? 1. How can I disable adding Items on the fly? I have a Purchasing Agent that has a habit of transposing digits when entering items on a PO. This usually results in them "accidentally" creating a new Item. How can I disable the feature to add items on the fly? I will take the option to do it by the user or as a whole in the Role. 2. RE: How can I disable adding Items on the fly? Great question - as far as I know there is no "Setup" that will disallow entering random characters into the Item field. 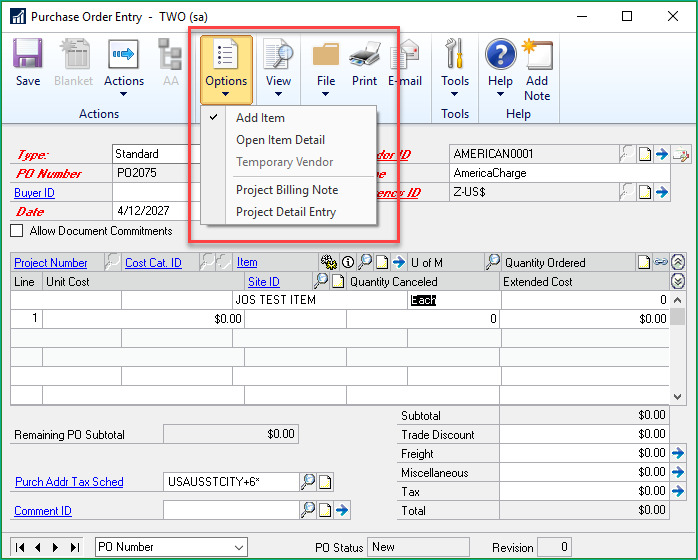 HOWEVER, the recommended method is to use the "Add Item" functionality on the PO Entry screen. If you enable this, then when someone enters non-inventory, misspelled or random characters a pop-up will open to ask if you want to "Add the item" which should alert the user they have entered something incorrectly. Subject: How can I disable adding Items on the fly? 3. RE: How can I disable adding Items on the fly? Thanks for the quick response Jo. 4. RE: How can I disable adding Items on the fly? I appreciate your dilemma. It can be a pain in the aspirations when users "accidentally" create chaos. If you cannot remove permissions without politics, then create a daily process that sends a report of newly created items to your purchasing department. If nothing else, the notification puts you in front of the issue. 5. RE: How can I disable adding Items on the fly? 6. RE: How can I disable adding Items on the fly? Have you tried removing their security to add inventory items? That way they can't access the adding of the items? 7. RE: How can I disable adding Items on the fly? I am having this same problem. I took away security to add an item (they can't see Item Card) but they were still able to create a PO using an item that doesn't exist. Are we sure this option works or am I doing something wrong? 8. RE: How can I disable adding Items on the fly? ​As Jo said, remove the security access to the Item maintenance screen then they can not add items. 9. RE: How can I disable adding Items on the fly? What is worse is when the user manages to enter a "non-inventory" item that is neither a true inventory item nor a charge but a line that isn't in the inventory tables at all, which Great Plains sees as an office supply sort of line, but which the user thinks is a real live inventory item. I have wrestled with the problem of turning off the ability to add stuff on the fly. Sometimes you just have to write Dexterity code to turn off stuff like that. Hasn't anybody here solved this particular problem? @David Musgrave, what do you think? One simple solution is to force the user to use the lookup button to pick the inventory items. You should be able to do this with field level security to make the inventory field non-editable, or you can do this with Dexterity. If that is too simple, in Dexterity you can try this: hide the original inventory item field, have the user enter the item number in a custom field which Dexterity copies to the real inventory field and triggers the script in the real inventory field. I say TRY, all programming is trial and error to a certain degree. 10. RE: How can I disable adding Items on the fly? The easiest method of stopping an on the fly add dialog is to use a before change trigger to check if the record exists in the table and if it does not, you display your own message and then reject script to abort the original code. 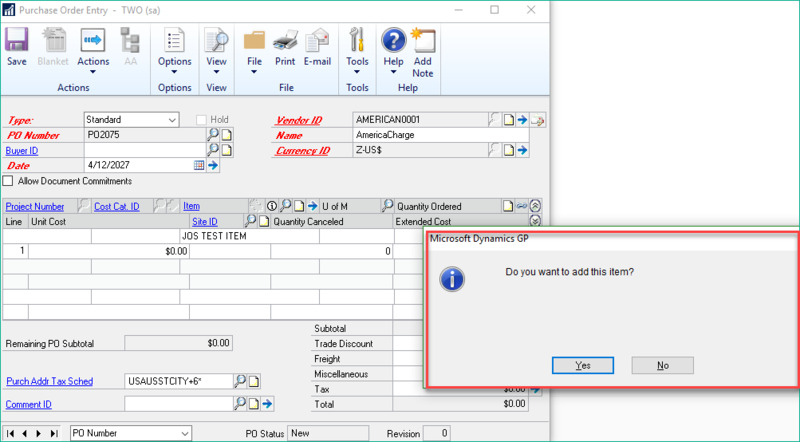 You can easily do this without Dexterity, VBA or VSTools using GP Power Tools - Development module. 11. RE: How can I disable adding Items on the fly? As long as the user doesn't need to be able to enter non-inventory items, why not UNcheck the Add Item option so they're not allowed to do so? Then, after making that change, take away security to that window so they can't recheck it. 12. RE: How can I disable adding Items on the fly? Our company dealt with this by creating a simple customization that doesn't allow users to get past the screen and add a description item instead of an actual inventory item. GP allows this in POP but not SOP so users would come to sell something they "received" in but inventory isn't affected and there are no quantities to sell. Let me know if you are interested in this customization and I can put you in touch with the VAR that built this for us at a reasonable cost. It simply is a pop up that states to have the inventory manager setup the item and doesn't allow the user to add it on a PO. 13. RE: How can I disable adding Items on the fly?